Back pain is a constant struggle for many Americans, and they need products that provide a solution. When you invest in a Relax The Back franchise, you’re helping your customers address a major obstacle in their life, and you’re tapping into a $500 billion market that keeps growing. Don’t wait to take the leap. The annual cost of chronic back pain in America. The amount of Americans who will experience back pain at some point in their lives. The number of workdays lost each year due to back pain. The annual amount spent on health and wellness nationally. Percentage of back pain sufferers that feel like they have no control over their pain. You don’t have to worry about getting the word out that your franchise is open. We’re already on it. 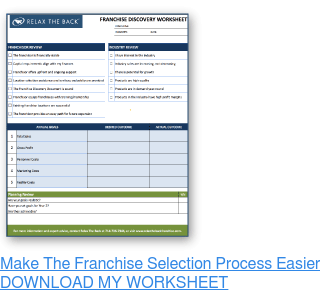 With comprehensive online and traditional franchise marketing materials, you'll be up & running and driving sales in no time. From the day you become a Relax the Back franchisee, our team is here to support you with extensive training and mentor programs, as well as sales and marketing assistance. Our support doesn’t stop when your franchise doors open. We’re with you every step of the way.